Our authentic Philadelphia-style sub shop features great subs and Philly Cheesesteaks, a simple operating concept and a proven success story with thousands of loyal customers in established markets. We make it easy for franchisees, from thorough training for your restaurant start-up, to opening and ongoing support. Whether you want to own and operate one franchise or ultimately manage a portfolio of Lenny's Sub Shops, we're looking for qualified individuals to become part of our winning team. Len Moore started his first Lenny’s Sub Shop with one ambition - to create a true Philadelphia-style sub shop, one just like those he enjoyed as a youth in Philadelphia. It just so happens that in the process he also created a fresh new franchise opportunity. Our Concept is Simple. You don't have to be a rocket scientist to operate a successful Lenny's Sub Shop restaurant. “Wow” is the word used most often by our guests to describe Lenny's food. 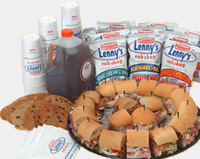 From fresh baked rolls, to the sliced to order meats, to the unique flavor profile of all our menu items, Lenny's is a Wow! We firmly believe that our subs, Philly cheesesteaks and salads are second to none in the marketplace; and after you try one of our sandwiches, we think you will agree. Clean, simple, inviting and comfortable are the words that best describe our Lenny's restaurants. A great deal of thought has gone into the design of our restaurant concept. Large display areas for menu items, oversized tables and booth seating, and the absence of trash cans in our dining room, are just a few of the many things most people may not notice, but greatly appreciate when visiting our restaurants. Very simply put. Lenny's goal is "More Food, More Taste, More Personality!" The people often tell us that they first came to Lenny's because of the food, but they keep coming back because of the service. Friendly and accommodating staff treat our guest the way guest should be treated in our own homes. In addition to the in-depth training program you go through prior to opening your restaurant, Lenny's will send a team of trainers to assist in training your employees and opening your restaurant. In fact, we are there for up to 10 days during the process of opening your restaurant for business to get you on the right track. After the initial opening, we come to visit you periodically to offer continue support and training. And all the time we are just a phone call away to help when you need it. Now that is great support! From the moment you sign on until after your store opens, we are with you every step of the way. We will assist you in site selection and building out your restaurant. We will train you in all aspects of operating your restaurant and our support doesn't stop once you start your business. From our prized recipe specifications, to our streamlined operations manual, to our ongoing operational support, we are here for you. Training: Our motto is More Food, More Taste, More Personality! and that includes more Training too. We do more than just give you our recipes and well wishes. Training begins the minute you sign your franchise agreement. You are given a self-paced study program to prepare you for our extensive classroom and restaurant training. After you learn the basics you get to experience a new restaurant opening with our operations team prior to opening your own restaurant. We guide you through every step to ensure you're ready to spread the "Lenny's magic" in your community. Real Estate: There are three main steps in securing a location: finding a broker, locating a site, and negotiating the lease. Lenny's Real Estate Department will be alongside you to assist in each of these areas. Because a solid location greatly increases your likelihood of success, we continually allocate extensive resources, including experienced personnel and the newest site evaluation technologies, to our Real Estate department. Human Resources: We develop and recommend proven recruiting, hiring and retention strategies to Franchisees. We also act as an HR Consultant on EEO, performance management, compensation and related issues, and provide resources, materials, and forms to assist with your hiring and employment processes. Information Technology: Lenny's provides a virtual private network to access the internet safely and allows for transmission of sales transactions to a centralized database system. We also manage the configuration and installation of POS equipment and provide ongoing POS enhancements, maintenance, and technical support with our 24/7 Help Desk System. Finance: Lenny's helps you find financing and banking relationships for your restaurant that meet your specific needs. 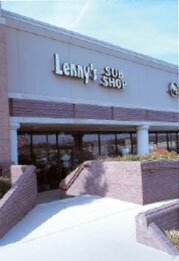 A typical Lenny's Sub Shop can often be opened for a cost ranging from approximately $150,000 to $225,000. This amount includes initial fees, construction, equipment, inventory, training and even working capital to get the business started. To learn more about the Lenny’s Sub Shop franchise opportunity, simply complete the form below.